Published Jun 25, 2009 by Pearson IT Certification. Part of the Network Simulator series. This state of the art simulation software allows users to practice their networking skills with more than 250 structured labs designed to reinforce CCNA and CCENT exam topics, including router and switch navigation and administration, LAN switching, IP addressing, routing, WANs, VLANs and trunking, IP routing protocols, scaling IP, and troubleshooting. Users will experience realistic network device response as they work through each of the labs developed by best selling author and expert instructor Wendell Odom. The software comes complete with 250 structured labs, including more than 180 skill builder labs, 50 complex configuration scenarios, and 20 complex troubleshooting scenarios. New Edition of the most effective router and switch simulator for hands-on CCNA skills enhancement is Now Available. Includes 300 labs, 8 different lab topologies, and more than 3,000 hands-on tasks. CCNA 640-802 Network Simulator, Second Edition (ISBN: 978-1-58720-444-9) helps you develop and improve hands-on configuration and troubleshooting skills without the investment in expensive lab hardware. This state-of-the-art, interactive simulation software enables you to practice your networking skills with more than 300 structured labs designed to help you learn by doing, the most effective method of learning. The labs are divided into four different types: 183 skill builder labs which help you practice short, focused configuration tasks, 47 complex configuration scenarios, which present realistic multi-layered configuration tasks, 20 challenging troubleshooting scenarios, which provide you with an opportunity to test your problem identification and resolution skills, and 50 subnetting exercises, which help you improve the speed and accuracy of your subnetting calculations. CCNA 640-802 Network Simulator helps you develop and improve hands-on configuration and troubleshooting skills without the investment in expensive lab hardware. This state-of-the-art, interactive simulation software allows you to practice your networking skills with more than 250 structured labs designed to help you learn by doing, the most effective method of learning. Experience realistic network device response as you work through each of the labs (available in electronic form on the CD), which include detailed instructions, topology diagrams, hints, and full answers. 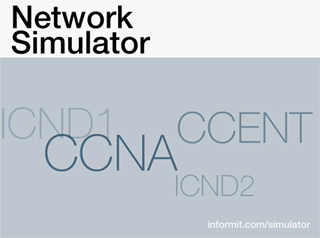 Unlike other simulators on the market, the lab scenarios included in the CCNA 640-802 Network Simulator are far more complex, challenging you to learn how to perform realistic network configuration and troubleshooting tasks. Although this product was published before these operating systems were released, this product has been tested and successfully installed on Windows 7 platforms as well as Mac OS X Snow Leopard (version 10.6). If you experience any trouble installing the software on these platforms, please contact Pearson Customer Technical Support at: http://www.informit.com/about/contact_us/.